Premium-grade WeatherMaster® Pro-Grade Ice & Water is a fabric-faced, high-temperature, modified composite roof underlayment suitable for all roofing applications. WeatherMaster® Pro-Grade Ice & Water underlayment is self-adhesive and can be used either as primary underlayment or as flashing tape to provide a secondary water barrier. Its SBS-modified asphalt coating prevents moisture entry by sealing uniformly around nails. WeatherMaster® Pro-Grade Ice & Water includes a tough, slip-resistant, poly-fabric surface that acts as a physical barrier to damage and protects against UV degradation and extreme weather. Use WeatherMaster® Pro-Grade Ice & Water as a primary roofing underlayment or as a secondary water barrier to protect the roof system against extreme weather. Learn and observe safe roofing practices according to OSHA and local building code requirements. Always use caution when walking on sloped roof decks and WeatherMaster® Pro-Grade Ice & Water underlayment. 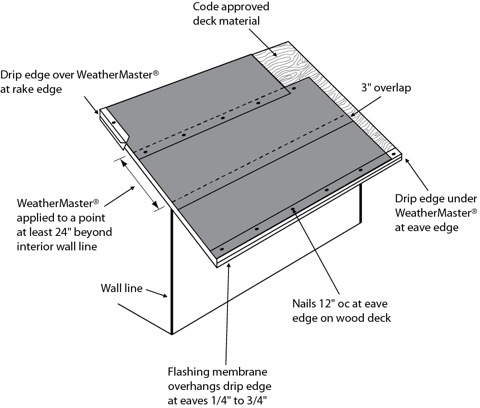 Do not walk on unsecured WeatherMaster® Pro-Grade Ice & Water or any other loose material lying on sloped roof decks. Dust, dew, water and debris create unsafe conditions on the roof. The presence of any foreign matter may drastically change the coefficient of friction (traction) on WeatherMaster® Pro-Grade Ice & Water or any other material on a sloped roof deck. Failure to always use proper safety equipment and footwear can result in serious injury or even death. To begin, remove any dust, dirt, loose nails or other protrusions from the roof deck. Remove all shingles, roofing felt and nails from the deck of existing roofs. Sweep thoroughly to remove any dust and dirt. Apply WeatherMaster® Pro-Grade Ice & Water underlayment only in fair weather when air surface temperatures are above 45°F and rising. Apply to dry surfaces only. Apply sheet parallel to the roof edge, extending over 1/4". Overlap edge seams 3", so that laps will shed water. End seams should be overlapped 6" and staggered. On steep slope applications it may be necessary to spot nail the top edge of the membrane temporarily during the installation process. For wrinkle-free application, cut WeatherMaster® Pro-Grade Ice & Water underlayment into 10 to 15 foot lengths and reroll. Peel back 1 to 2 feet of release paper. Align the sheet on the lower edge of the roof and adhere the first 1 to 2 feet. Pull the release paper from under the sheet and continue to peel it while pressing the sheet into place. Roll lower edges firmly with a wallpaper roller or other hand roller. For ice dam protection, WeatherMaster® Pro-Grade Ice & Water underlayment must be applied to reach a point above the highest expected level of ice dams (minimum application at least to a height of 24" beyond the interior wall line). End laps should be overlapped 6" and staggered. When installing at temperatures below 45°F and on slopes above 8" in 12"—face nail in the overlap area at the top of the sheet at 12" OC. Priming the deck may be necessary below 45°F. Cut WeatherMaster® Pro-Grade Ice & Water underlayment into 4 to 6 foot lengths. Peel the release paper and center sheet over valley or ridge. Drape and press sheet into place, working from the center of the valley or ridge in each direction. For valleys, apply the sheet starting at the lowest point and work upward. 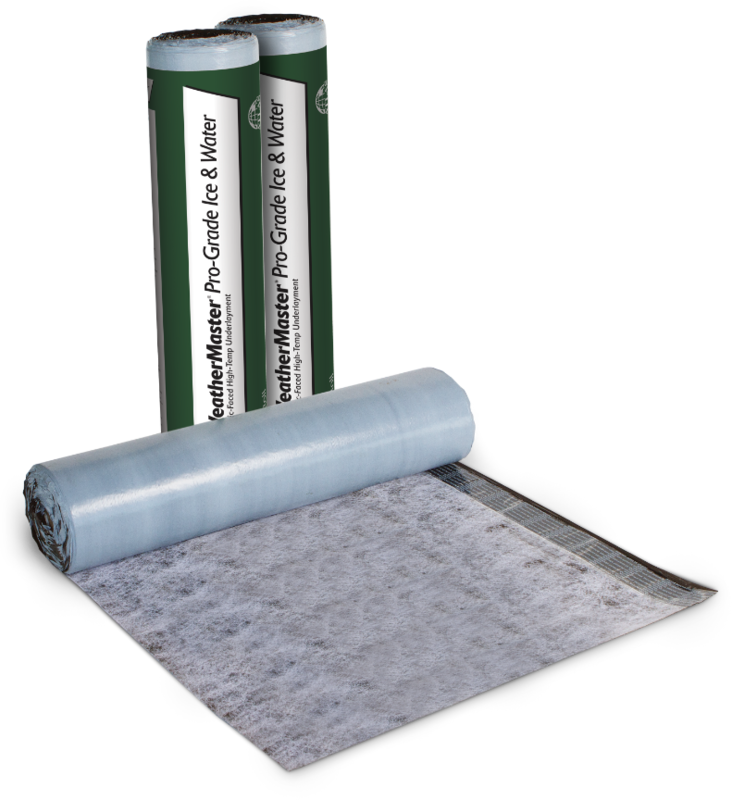 WeatherMaster® Pro-Grade Ice & Water underlayment should not be left permanently exposed to the weather. 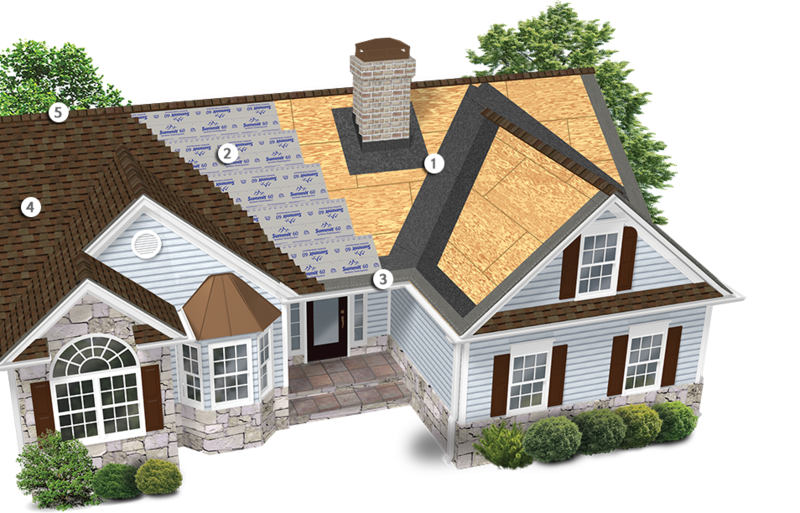 It must be covered by shingles, metal valley flashing or other roofing materials within 45 days. Overlap horizontal overlaps at least 6" in valleys. Smooth shank galvanized nails are recommended for fastening shingles. Do not overdrive nails or break the surface.